Open University, also known as Dr. B.R. Ambedkar Open University is a public university in the city of Hyderabad.Open University system is flexible in terms of Admission, choice of courses, duration and age requirements, teaching methods and evaluation procedures. Thus it offers the alternative channel to those who missed the opportunities for higher education. Dr. B.R. 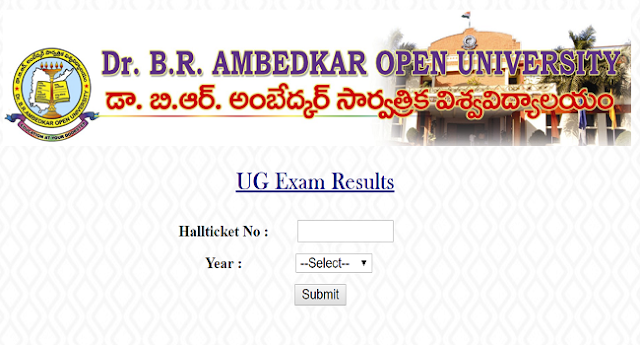 Ambedkar Open University is Education at Your Door Step.Its official website is www.braou.ac.in. Online Web Portal is www.braouonline.in. this is for online registrations. Last date for Revaluation of UG II Year exams Spell-I APRIL/MAY-2017 is 30-07-2017 Apply Online Only. Dr B R Ambedkar Open University (BRAOU) announced the results of undergraduate (BA /B.Com /B.Sc) I year Spell I exams. The results were made available on the university's official website, www.braou.ac.in and the web portal, www.braouonline.in. The last date to apply for re-evaluation is.....!. ~Last date for Revaluation of UG I Year exams Spell-I MAY-2017 starts 08-08-2017 to 18-08-2017. The UG I.II,III results would be released in every year by the BRAOU officials at their official website braouonline.in or braou.ac.in. These results of BRAOU UG First, Second and Third year Exams would be available on Online web portal. Students of BRAOU, who were appeared in the above examinations stream can heck their results from the given following link. Last date for Revaluation of UG I Year exams Spell-I MAY-2017 starts 08-08-2017 to 18-08-2017.. When is announced date Braou ug 1st year exam results, spell-1 june-2014. . Please tell me sir?, answer send my email. . . And tell me this is website. . Argent. .
And tell me this is website. . Urgent. .
when i get the ug 2nd yr spell 2 result plz reply..